Besides all of that - it is just a very good chocolate chip cookie which I've made often before even being aware of dietary restrictions. Cream butter and sugars, add vanilla and beat until fluffy. Add the flour and salt and mix well. Dissolve baking soda in boiling water and blend into mixture. 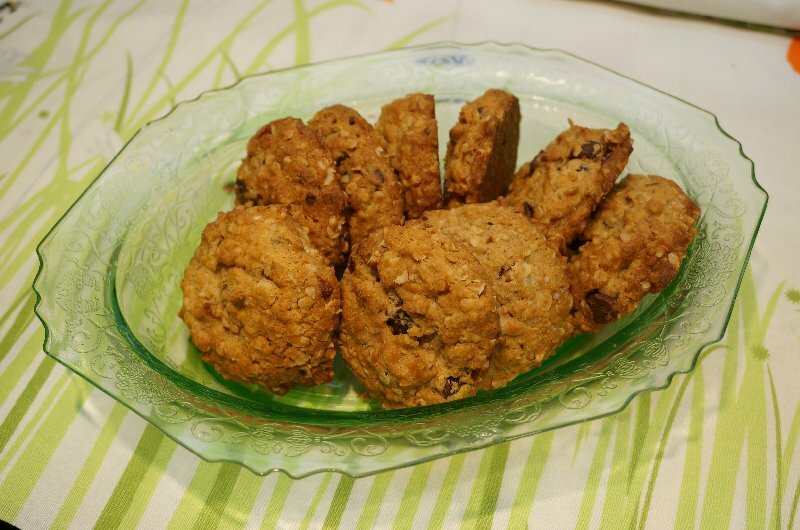 Stir in oatmeal, nuts and chocolate chips. Drop by teaspoonful onto cookie sheets. Bake at 350º F oven for 10-12 minutes. What kind of vegan butter did you use? I use "earth balance" vegan cooking & baking sticks & find they work wonderfully as a substitute for butter or margarine. I purchase mine at the local health food store. Thank you so much for posting this. I will definitely be making these. I started eating vegan months ago and have discovered how rich and wonderful food can taste without dairy. Amazing! This was the Chocolate Chip recipe I grew up! How exciting to have it posted on your wonderful blog! This is a great recipe Bev - THANKS! The chocolate chips should also be Enjoy Life brand or something similar to ensure that they're dairy-free/vegan. Looks great! Can't wait to try it.